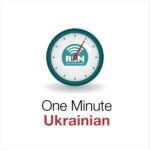 One Minute Ukrainian introduces the Ukrainian language in small steps: each lesson lasts just a couple of minutes and by following the ten lessons of the series you’ll pick up just enough Ukrainian to get by in a variety of situations. Topics include greetings, common words, introducing yourself, talking about learning Ukrainian and language difficulties, numbers, asking people how they are and other useful phrases. Our lessons will be published every Wednesday from 20 October for ten weeks. Listen to the introduction to the series below.